Come see Wild Ontario! Spend the evening learning about wild animals, the environment, and how we can help save the planet. There will even be a demonstration with a few bird visitors! 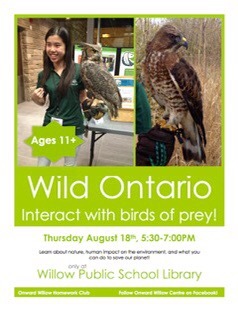 For ages 11+ on Thursday, August 18th at the Willow Public School Library. See you there! Please RSVP in the comments, as space is limited. ‹ PreviousIt is Halloween planning time!!! Next ›Suits, Suits and More Suits! !